Upgrade! SF at Asterisk San Francisco ~ Workshop with Los Angeles-based artist Sara Schnadt!! Upgrade! SF is kicking off its 2013 season! As many of you know, we received an Alternative Exposure Grant from Southern Exposure last year to produce a few workshops on new media art — these are led by artists are create work that is not just technical but also has strong conceptual underpinnings. In this vein, we’re proud to present “Network Gestures”, a workshop led by Los Angeles-based artist, Sara Schnadt at Asterisk San Francisco (http://www.asterisksanfrancisco.com/), which is an amazing magazine and art gallery in the Mission District, located at 3156 24th St. The workshop is on the weekend of April 20th-21st and is $50. Please consider joining! And spread the word to those who also might be interested. We’re also very likely having an Upgrade! SF talk by Sara on Thursday 4/18 (just confirming the venue, more info to follow). Mark your calendars! Join Los Angeles-based artist, Sara Schnadt, for this hands-on workshop and map invisible data and social networks with everyday materials. Participants will learn how to translate data visualization concepts into small-scale art installations. The finished projects will be displayed at Asterisk San Francisco Magazine. Los Angeles-based artist Sara Schnadt explores technology in her work both as subject and media. Her installations and performances use found objects, interactivity, projection, and movement derived from common gestures. Much of her work involves representations or data that translate large quantities of socially resonant information into poetic forms, including data visualization. 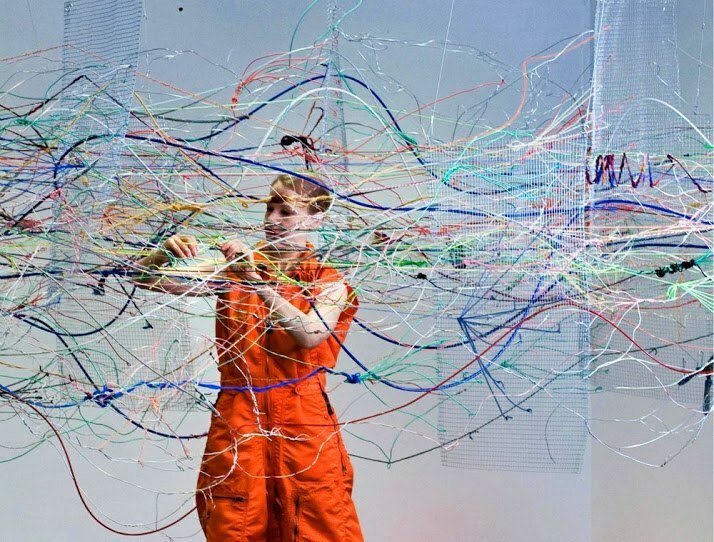 She often performs within accompanying sculptural environments, attempting to articulate the personal within virtual and technological innovation. 1pm – 5pm, complete projects and present. “Network Gestures” is produced by Upgrade! San Francisco, a regular programming series with speakers and socializing designed to foster community around new media arts in San Francisco. Support for this workshop is provided by Southern Exposure’s Alternative Exposure Grant Program.